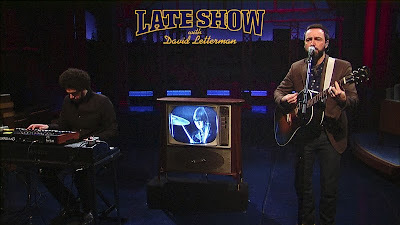 Broken Bells - the duo comprised of The Shins’ James Mercer and producer Brian Burton (better known as Danger Mouse) - performed The Beatles’ classic “And I Love Her”, complete with the added visual of drummer Ringo Starr playing along via video displayed on a vintage television set. The Late Show is filmed at the Ed Sullivan Theater, site of the Fab Four’s iconic U.S. debut on February 9, 1964. The Beatles’ first “Ed Sullivan Show” appearance is hailed by many historians and critics to be one of the most important moments in music and television. Beatles Week continued Tuesday with Sting, will feature Lenny Kravitz on Wednesday, and the Flaming Lips with guest Sean Lennon on Thursday.